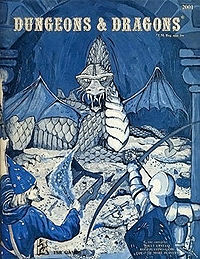 Information about different versions of "Basic Dungeons & Dragons"
1977: Holmes collates the "basic" set, incorporating much of Supplements 1 & 2 into the rules. White editions of original rules sold as "Classic D&D", AD&D announced. 1979: AD&D starts to be released, with the PH, based firmly in Holmes' work. original or Classic D&D: levels 1-10+, Fighter, Mage, Cleric. All weapons do 1d6 hit points (at least one printing is missing that line). All hit dice in d6's with mods; completely reroll HP each level. Races are not classes. CD&D Supplement 2: adds druids and assassins. Adds more stuff, too. Holmes Basic: I don't have a copy; no details I can check. ISTR it used the supplement 1 stat effect tables. Allston Wrath of the Immortals: complete rewrite of the immortals rules; works differently in many ways, includes a campaign adventure for both immortals and non-immortals (two sides of the same story!). Covers more details onthe multiverse and planes, covers levels I1 to I36, and on how to become immortal. Advanced D&D just for clarity, Advanced D&D starts off with almost all of Supplements 1, 2, and 3 incorporated into the Player's Handbook and Dungeon Master's Guide. It uses the asymmetric stat modifier tables, variable damage by weapon, no racial classes, has Fighter, Cleric, Thief, Mage, Ranger, Paladin, Monk, Assassin and Druid, and a funky Bard class as well. It included the Supplement 3 psionics rules in an appendix, and was revised by Gygax from a base of Classic and Holmes.